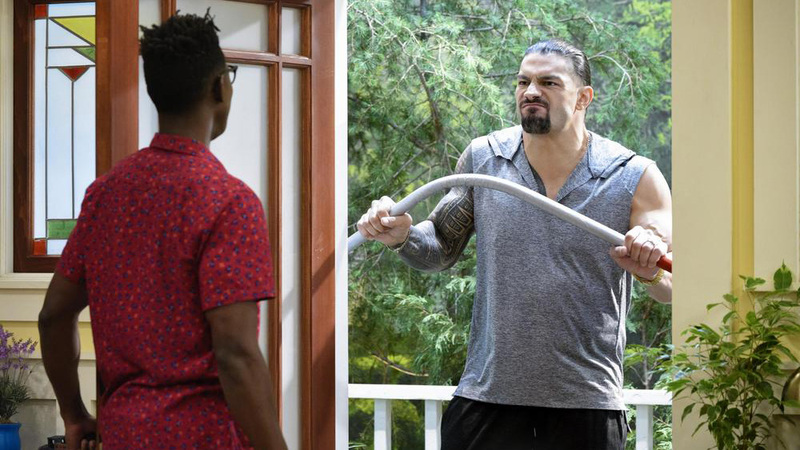 Roman Reigns is set to guest star in an upcoming episode of Nickelodeon's newest comedy series, Cousins for Life! The 33-year-old former Universal Champion, who is currently on leave from WWE while battling leukemia, will return to television in the brand-new Cousins for Life episode “A Farewell to Arthur?”, premiering Saturday, March 2, 2019 at 8:30 p.m. (ET/PT) on Nick USA. In the new episode, Reigns plays Leaf’s neighbor Rodney who is angry that Leaf’s pet pig Arthur (Sally Sue) dug up his vegetable garden. However, Stuart (Dallas Dupree Young), Ivy (Scarlet Spencer), and Leaf (Micah Abbey) discover there’s more to the story and come up with a plan to save their beloved pig. 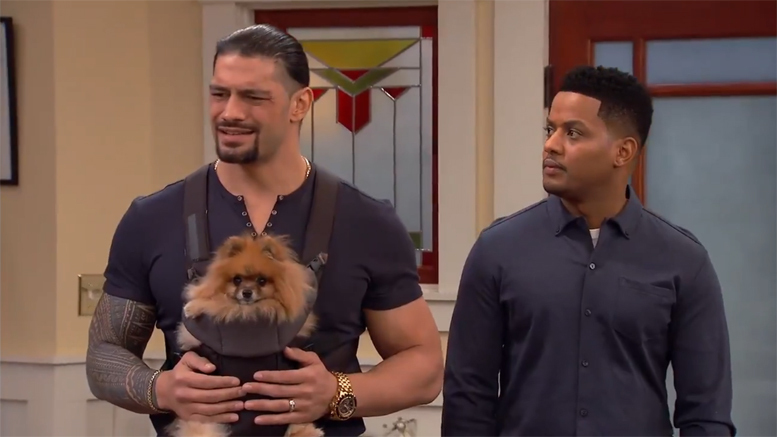 Go behind the scenes of Roman Reigns' guest role on Nickelodeon's hit show "Cousins for Life." Courtesy of "This Week" on WWE Network. Reigns (real name Joe Anoa’i) has been off WWE television since announcing on Monday, October 22, 2018 that his leukemia had returned and relinquishing the Universal Championship. His Cousins for Life role marks his first television appearance since announcing the news. The Nickelodeon spot is not The Big Dog's only upcoming acting role. It was revealed last month that Reigns has a role as Hobbs' brother in the Fast and the Furious spinoff "Hobbs & Shaw." Hobbs is played by Reigns' cousin Dwayne "The Rock" Johnson, who stars alongside Jason Statham in the movie. The two roles will be Reigns’s first in projects not produced by WWE. After his role in the film was announced, Reigns wrote about his battle with leukemia and how spending time with Johnson in Hawaii filming the movie has helped him: "The time I‘ve spent with my cousin on this wonderful island has truly been a healing grace. I am grateful to the @wwe @therock @universalpictures and everyone on the set of HOBBS & SHAW, for allowing me to be a part of this franchise. "All of your outreach and support has been a blessing and it’s only pushed me to get back in the ring as soon as possible. "But until then...I’m excited for this movie to premiere this summer, our culture and mana in this film is strong!" On Monday’s (March 25, 2019) Raw, Reigns revealed the amazing news that his leukemia is back in remission! Reigns even got back to action a little bit, coming to the aid of former Shield teammate Dean Ambrose. Check out a sneak-peek of Roman Reigns on Cousins for Life in the video player below, and make sure to watch the brand-new episode, premiering Saturday, March 2, 2019 at 8:30 p.m. on Nickelodeon USA! More Nick: Nickelodeon USA's March 2019 Premiere Highlights! Originally published: Friday, February 8, 2019 at 8:55pm GMT. Sources: Sports Illustrated, WON/F4W, WWE, Wrestling News, Pro Wrestling Sheet, 411MANIA, EWrestling. Follow NickALive! on Twitter, Tumblr, Reddit, via RSS, on Instagram, and/or Facebook for the latest Nickelodeon and Cousins For Life News and Highlights!